investigation capabilities of the Securities and Exchange Commission (SEC), shared a sliver of this page-turning story with 60 Minutes, and become perhaps the world's most visible and insightful whistleblower on fraud and conflicts of interest in financial markets.Throughout the book, Markopolos and his Fox Hounds tell their first-hand story of investigating Madoff-with the help of bestselling author David Fisher. They explain how they discovered the fraud, and then how they provided credible and detailed evidence to major newspapers and the Securities and Exchange Commission (SEC) many times between 2000 and 2008, only to have his warnings ignored repeatedly by the SEC. Provides a firsthand account of how Markopolos uncovered Madoff's scam years before it actually fell apart Discusses how the SEC missed the red flags raised by Markopolos Describes how Madoff was enabled by investors and fiduciaries alike The only book to tell the story of Madoff's scam and the SEC's failings by those who saw both first handDespite repeated written and verbal warnings to the SEC by Harry Markopolos, Bernie Madoff was allowed to continue his operations. 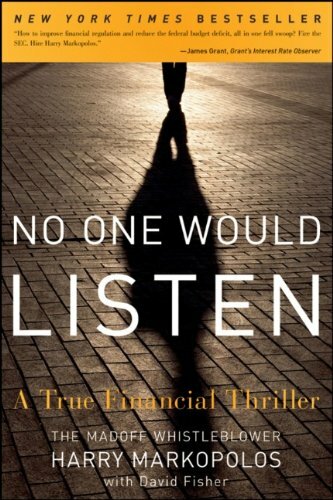 No One Would Listen paints a vivid portrait of Markopolos and his determined team of financial sleuths, and what impact they will have on financial markets and financial regulation for decades to come. HARRY MARKOPOLOS, a former securities industry executive turned independent financial fraud investigator, was the whistleblower who provided credible and detailed evidence several times from 2000ï¿½2008 that should have prompted an immediate investigation by the United States Securities and Exchange Commission into Bernie Madoff's $65 billion Ponzi scheme. Markopolos's investigation was assisted by his investigative team, including Frank Casey, Neil Chelo, and Michael Ocrant.